Here is a link to the abstracts of the individual chapters of C. West Churchman’s ‘The systems approach and its enemies’, which was Churchman’s last book of his great trilogy. Churchman’s work is the focal point of CSL4D. I used the abstracts to produce a concept map (see below), which I will describe in this post. I believe it could serve as a useful introduction to Churchman’s work. This post has been reblogged by The Systems Community of Inquiry at https://stream.syscoi.com, the global network of systems thinkers, scientists and practitioners (Thanks!). Problems Many human “systems” function poorly. The question is: what can be done about it? Fixing the most obvious problem in systems often doesn’t work, but even makes the situation worse, delays a real solution, or simply costs a lot of money and effort to keep it functioning, be it poorly. Systems thinkers believe that such problems – often designated “wicked problems” – are caused by taking too narrow a view of the situation. Such a narrow view is what Churchman calls the ‘environmental fallacy.’ This fallacy is not part of classical logic. 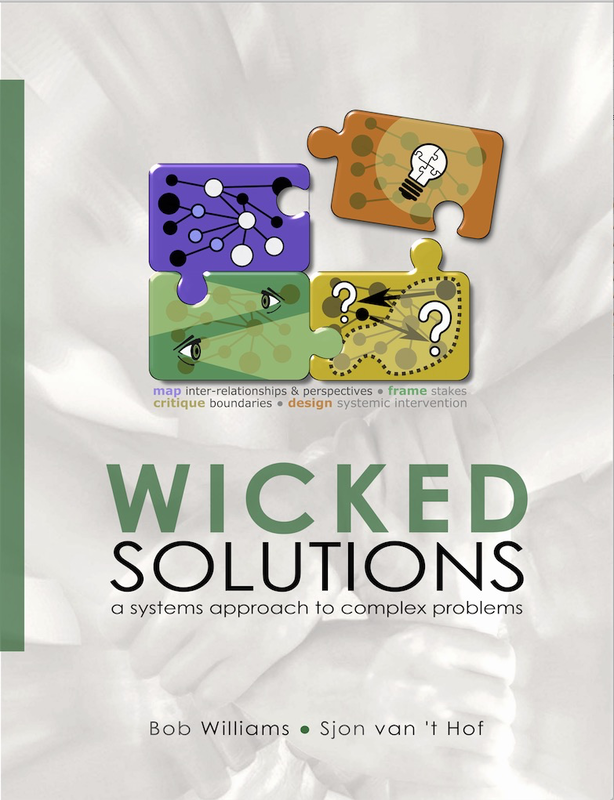 In fact, a whole set of new principles had to be developed in order to provide a solid foundation for addressing wicked problems. One of them is the Maximum Loop Principle (see here). People Among the principles that Churchman developed are also the four principles of deception-perception. The key idea is that when we perceive a problematic situation in a certain way, this obscures certain key aspects that can only be brought to light by perceiving it in a totally different way. The essence of the systems approach, “therefore, is confusion [deception] and enlightenment [perception]” (The Systems Approach, p. 231). In Churchman’s words, we must see through the eyes of others to discover the restrictedness of our own perspective (including that of ‘experts’ or ‘managers’). We must also abandon any claims of absoluteness (without falling victim to the idea of relativity, which is replaced by the idea of approximation). Churchman’s great “trick” is to build a categorical framework centered on people. These people play roles in system design as client, decision-maker and/or planner. “And/or” here means that people can play different roles at the same time. It is the key to systemic inquiry as described in “The design of inquiring systems” (Churchman 1971, see also here). Enemies The systems approach is a rational system. Humans are not always rational, or our last name would be Spock or something. Rationality is also not easy to achieve. It is not always very convincing. Many a rational systems plan has disappeared in the bottom drawer (as have many other plans). Churchman identified 4 main “enemies”: politics, morality, religion and aesthetics. Politics is the easiest to explain: politics is all about getting enough support to get things done. In other words, politics is necessary for implementation. This usually means that the plan has to be adjusted to suit the wishes of various supporting parties. The plan becomes less rational. It will not serve the intended client (or beneficiary) as well as the planner would like to. That’s when the boundary critique becomes important. Similar things happen with the other enemies. Heuristics The categorical framework is a heuristic for operationalizing Churchman’s systemic principles. The categories unfold by asking the basic ethical question: who is and who should be the client? What is and what should be the purpose? In England Churchman’s framework is used a lot, be it in the form of Ulrich’s “critical heuristics”. Ulrich was a Swiss student of Churchman in the late 1970s. His “critical heuristics” uses an adaptation of Churchman’s categorical framework. The good thing about critical heuristics is that it is easier to learn. It leaves out the entire “enemies” part. It is also part of the methodology described in Wicked Solutions, which has been used repeatedly at universities in Europe, Australia and the United States. Significance … is the last category of Churchman 4 x 3 framework. Churchman went flat out to make sure the dialectical systems approach was a significant contribution. Part of his approach was to seek the maximum generality. This allowed him to contrast it to existing philosophical schemas, oppose it to classical logic, and ensure the broadest possible applicability. This doesn’t mean there are no problems with it. In the preface Churchman writes that generality in the context of social systems is a highly debatable concept, because social systems are never wholly rational nor wholly irrational. They are beyond that. This means that in the end the effectiveness of the systems tool is in the eye of the beholder. If it works, it is OK. But that type of argument would apply to many another approach, especially the one associated with politics. Book abstract The design of social systems (organizations, businesses, projects, governments, nations, the world) in the most general sense is described and guidelines for system design are provided. It is argued that social system design is beyond dichotomies such as rational-irrational, teleological-ateleological and objective-subjective. 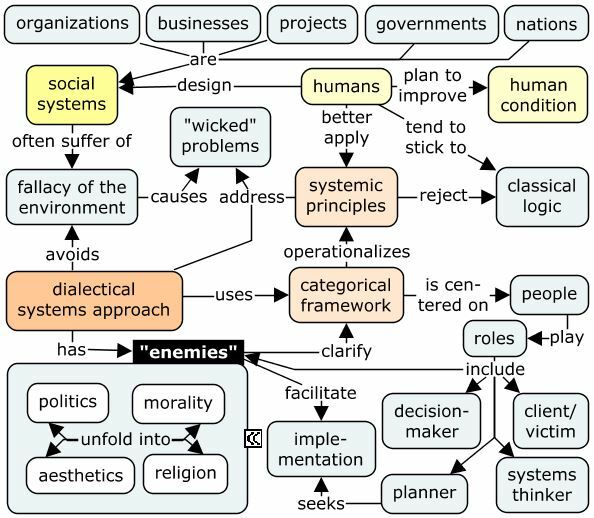 Churchman proposes the dialectical systems approach as a rational solution for the so-called “environmental” fallacy, but admits that irrational “enemies” or non-friendly viewpoints are necessary to come to a fuller understanding of the systems approach. The historical roots of the systems approach in Western and Eastern thought traditions are explored, the limitations of classical logic are outlined, and the need for an alternative “whole system” form of logic and objectivity is discussed, in which people are the center of the planning reality. The first nine categories of Churchman’s framework are described, followed by a detailed discussion of the problems of a systems approach defined from within as contrasted with the outside perspectives of the “enemies” such as politics, morality, religion and aesthetics. Suggestions for unfolding the different categories into each other are included. Well, that’s it. Now you can read the abstracts or the original book. Do not forget to put some of the abstracts, or at least the book abstract, in your university’s catalogue. You may also prefer to make your own abstracts. It’s good exercise. To get a better feel of what it is all about you may also go through a worked out case in Wicked Solutions.